If you have problems installing a plug-in, one reason may be because Windows has set a flag on the plug-in file. This means Windows doesn't know where this file came from. This typically happens for files downloaded from the internet or received through email. 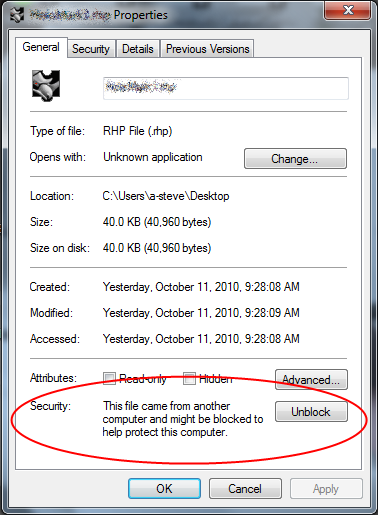 For security purposes, Windows will not load the plug-in into Rhino unless you unblock the file. Right-click on the file and choose Properties from the context menu. You should see a dialog that looks like the image at the bottom of this page. Right-click on the Rhino shortcut icon. Select Run as administrator.